Within one year after he won his last Tour de France, it is clear how much influence Lance Armstrong has had on the US bike market over the past decade. In general, bike sales have grown in the US ever since Lance Armstrong won his first Tour de France in 1999. COSTA MESA, US – Within one year after he won his last Tour de France, it is clear how much influence Lance Armstrong has had on the US bike market over the past decade. In general, bike sales have grown in the US ever since Lance Armstrong won his first Tour de France in 1999. His consecutive successes pushed the bike market up from 17.5 million units in 1999 to 19.8 million in 2005. The peak year was 2000 with 20.9 million bikes of all sizes sold in the US. In the year after his retirement, sales dropped 8%. The total number of units went down from 19.8 million in 2005 to 18.2 million last year. The latest figures of the National Bicycle Dealers Association (NBDA) over 2007 indicate that the 2006 decrease seems to be only temporary. A market recovery is generally expected for 2007 as a whole. The numbers of bikes sold during the first two months of this year were 4% above January-February 2006. The difference between the various categories has been substantial. While the sales of the smaller bikes are still in minus, MTB and especially road race are picking up very quickly. In 2006, approximately 75% of all new bicycles were sold through the mass merchant channel. The average sales price is only US$ 72 (€ 53.29). As a result, the mass channel takes only 37% of the turnover in value. The IBDs account for some 17% of the US bike sales in units. The average price of the bikes at the IBDs is US$ 422 (€ 312.36). The third sales channel is the sporting goods stores like The Sports Authority, Champs Sports, JumboSports, Sportmart and Big5. They sold some 5% of all bicycles in 2006 at an average price of US$ 225 (€ 166.54). Although its market share has dropped dramatically, still some 28.5% of all units sold at the IBDs are mountainbikes. 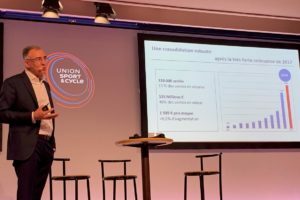 With an average price of US$ 1,152.68 (€ 852.80) for a full suspension and US$ 391.31 (€ 289.50) for a hardtail, it is obvious how important this segment is for the IBDs. In line with Lance Armstrong’s success in the Tour the France the market share of road bikes has gone up from 10.8 % in 2004 to 17.0% in 2006. The average price of the road bike is even higher than the mountain bike. They average price of a bike ‘like the one Lance Armstrong rides’ is US$ 1,319.97 (€ 976.56). As of 2004, in terms of turnover, road race has become much more important than the MTB. At that time the sale of the road race bikes contributed 28.3% to the retailer’s turnover, and the mountain bike added another 25.61%. That makes the road race bike the most important product for the IBDs. The third category is the youth bike taking a market share of 16.5%. As in many other countries, IBDs have lost a lot of this segment to the price mass channel and toy stores. The cruiser segment has picked up rapidly in the past years. Although not very big yet in numbers, the cruiser bike in 2006 represents 6% of the IBDs sales in terms of units. The US bicycle market is fully dominated by imported bikes. In 2006, it is estimated that 99.3% of the bicycles sold in the US were imported. China, Taiwan and Hong Kong accounted for 99.55% of the annual bicycle imports. 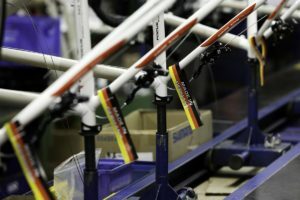 Only a few dealer brands do have some production left in the US, including Trek and Cannondale. Next to it, there are dozens of smaller US custom bike makers, maybe 100 in all. But most models of the dealer brands, like Giant, Specialized, Raleigh America, Schwinn, GT and Haro are made in China or Taiwan and imported by Huffy Corporation, Magna, Pacific, Rand or Kent. 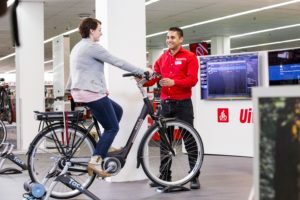 The first trend on the US market is the continuing decline in the number of specialist bicycle stores, but it is the only distribution channel that maintained or increased the average retail price. The number of shops went down from 6,195 in 2000 to 4,600 in 2006. The remaining ones are becoming bigger and bigger in terms of volume and turnover. The shops that are member of the National Bicycle Dealers Association have an average gross revenue of US$ 622,917 (€ 460,706) annually (figures 2006). Second trend is rapid growth of some ‘new’ categories. 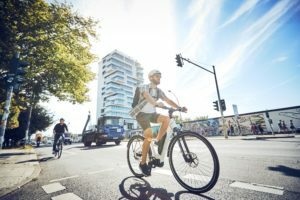 US statistics do not give figures for potentially powerful categories like electric bikes and folders. 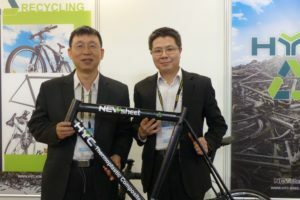 Especially the electric-assisted bicycle does have a huge potential when one is prepared to consider sales in China and Japan as an example, and the European market as a trend follower. Finally the growing eco-consciousness of the American public. This is pushed by Al Gore’s ‘Inconvenient Truth’. According to the daily newspaper Star Tribune, one of the results of the eco-consciousness is that several big cities, like New York, really like the idea of levying tax on all cars entering the downtown area, as they do in London. When introduced, forecasts Star Tribune, it will cause an explosion in a new kind of park-and-ride. People park their cars on the edge of downtown and ride on a bike they pull out of the trunk. Bike safety and compulsory helmet wear are currently under discussion in several States. Experiences in several other countries have shown that the enforced use of helmet has a devastating effect on the frequency of bike use. Therefore, each new initiative is aimed at a step-by-step acceptance of the bike helmet. New Mexico has recently passed a new law requiring the use of helmets for children under 18 when riding wheeled vehicles including bicycles. The New Mexican law goes a step further than in neighbouring California, saying that riders under 18 must wear a helmet when riding a tricycle or a motor scooter. Recently a preliminary vote in the Senate of Maine approved a new road safety bill. This makes bike helmets compulsory for children under 16 including an enforcement provision. The new road safety bill is backed by the Bicycle Coalition of Maine. Last years Interbike showed a remarkable resurgence of the new style single-speed or coaster. Although this product is not new to the US market, it is reviving a second youth. One of the reasons could be that manufacturers got so caught up in the technology race that they forgot about consumers who do not share the designers’ passion for levers and gizmos. A lot of people don’t want to worry about a complicated derailleur. Another advantage of the single-speed bike is the durability in bad conditions. There is no gear mechanism to freeze with ice in the winter or clog with mud when riding off-road. Single-gear bikes should not be confused with fixed-gear bikes. They are controlled entirely by the pedals. These types of bicycle are popular among bike-messengers. For those bikers who do not want to give up the benefits of gears the hub gear is an attractive alternative. The next step is the automatic shifting known as ‘Shimano Coasting’. In the USA only three manufacturers offer them: Trek, Raleigh and Giant. For the fourth consecutive year the combined sales of all types of Powered Two-wheelers (PTWs), have crested the one million level. Sales continued showing consistent strength in 2006, ending with a 14th straight year of growth. The Motorcycle Industry Council’s preliminary estimate on new unit sales for all brands last year is 1,158,000, a slight increase over 2005. In that year 1,149,000 units were sold. This continuing popularity is due to the fact that the image of motorcycling is gradually improving. A motorcycle today is considered a respectable form of recreation and, increasingly, transportation. In this country where cars are dominating society, more and more people meet with rising fuel prices and the problems of highway congestion. In warm and dry states, the powered two-wheeler is a fine alternative. Two categories profit most of the increasing popularity of motorcycle. At first the scooters and second the dual-purpose motorcycles, built for on- and off-road use. The biggest rise in sales has been achieved during the first six months of 2006, when double digit sales increases were reported. Since 1993, when the sales started to rise again, the powered two-wheeler market in the USA has changed dramatically. The old ‘easy rider’ image has changed to gain acceptance as a great form of transportation and recreation. The motorcycle use in the US was dominated by a small group. These days, even generation Y-Americans, entire families and growing numbers of women ride a motorcycle. The leather riding jackets have become fashionable again. Simultaneously, the motorcycle itself has improved tremendously in performance, style and variety.